September 19th in WordPress Themes by Wordpress Jedi . In the past few months, we have covered plenty of useful online directory themes. Want to build a website to cover local food business? Food Guide for WordPress has you covered. 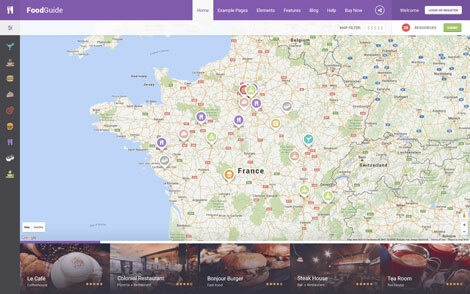 It is a commercial theme that lets you add restaurants and other food places to your online directory. The theme comes with a fully responsive design and drag & drop page builder. Food Guide supports 5 header types, including 3D Google map or a slider. It has a mega-menu system and Google fonts. This theme is WooCommerce ready. Webmasters can create packages and set prices from the back-end. They get 20+ elements to customize their site. Food Guide lets you build your own online restaurant directory. It comes with automatic updates. This is a commercial theme by an Elite Author.